Sparkling Crystal Knife Rest for Fine Dining Formal Entertaining Set Of 6Pc 4"
Oggi 7048 Stainless Steel Spoon Rest Durable Rest Fits 8.25" x 4.5"
Features a classic Mickey and Minnie Mouse taking a stroll. Made of durable Ceramic with red backdrop and red Mickey Icons. Perfect for any Disney lover. These spoon rests are the perfect addition for the Disney lover in your life. Classically styled Mickey Mouse sitting against black and white stripes with reg "Mickey" signatures. Made of Ceramic. Use this handy Spoon Holder to keep your counters and stovetop clean. 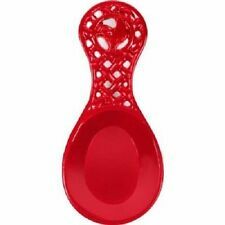 This vertical holder takes up less space than the traditional lay flat spoon rest. Made of stainless steel, it measures 7" tall. Totally Bamboo's Catch All Spoon Rest with Caribbean Inlay design is not only beautiful it's also a well-built kitchen tool and organizer. It's made of high quality Moso bamboo. 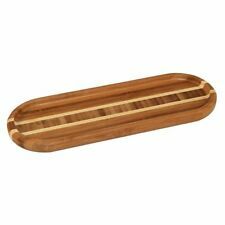 Easy care; simply wash tray by hand with warm water. 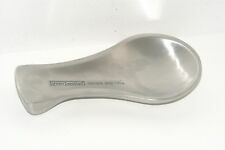 When you've got two recipes bubbling away on the stovetop and don't want to mix one with the other you'll appreciate this double spoon rest when it comes time to stir. Even when not on duty this kitchen helper is appealing as its gleaming stainless finish and artistic design give it the look of modern art. Made of 100% Ceramic Measures 5 1/2 inches high Ceramic with glazed finish 3 hole opening on Mickey for salt 2 hole opening on Minnie for pepper Rubber seals on base for easy refills These adorable Mickey and Minnie Mouse salt and pepper shakers will spice up your kitchen table. Put them face to face and it appears that they are kissing. The Minnie Mouse shaker features 2 small holes on the back of her head ideal for pepper. The Mickey Mouse shaker has 3 small holes for a more generous portion of salt. They feature rubber stoppers on the bottom for easy refilling. This is a must have kitchen essential for the Disney fan in your home. Wash by hand or in the dishwasher. Made from durable plastic, BPA free. 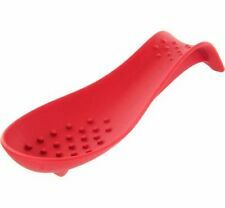 Spoon Pot Clip How many times have you wiped and rewiped messy drips from your stovetop or counters? Well, no longer! The Spoon pot clip, is a must have for all cooks. A practical, space and sauce saving little utensil...it'll make you wonder how you got along without it. The Utensil Pot Clip securely attaches to the edge of most cookware, and will hold your spoon, spatula, fork or most utensils. Any drips will just fall right back into the pan...where they should be in the first place. Great way to save space, waste less and make clean up a snap! Professional Gauge stainless steel frame. High heat silicone pads clip onto the pot/pan. Spoon/spatula drips directly into pot and utensil handle stays cool. Keep your stove top clean with this stand and dish no more messes. FLATWARE 1847 Rogers Bros. 5 1/2" long x 4" wide. CHINA & DINNERWARE. Melamine, Clara style, spoon rest. Pioneer Woman. New opened. Farmhouse spoon rest from magnolia market. These spoon rest sold out at Target. Made of 100% Ceramic Measures 10 1/2 X 4 1/2 inches Shaped like mouse ears with Mickey or Minnie Mouse details Sturdy ceramic construction Safely holds spoons, ladles, spatulas and more while cooking Great addition to the kitchen of a Disney lover This adorable spoon holder is a great addition to your kitchen. 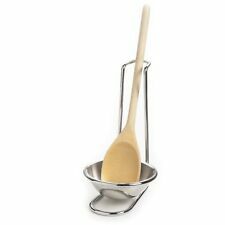 Keep it by the stove to hold your spoon, spatula or ladle while you are cooking. The spoon rest is ceramic and heavy enough it will not slide around the counter while in use. The classic mouse ear shape tray features either Mickey Mouse pants or a Minnie Mouse bow and the long handle features the classic autograph. 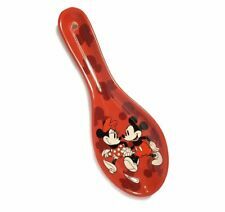 Make cooking dinner a little more fun by adding a Disney spoon rest or two to your kitchen counter. 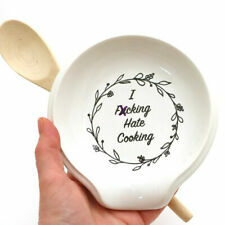 Use this 10" spoon rest to hold spoons and gadgets of all sizes while cooking. Dishwasher safe. 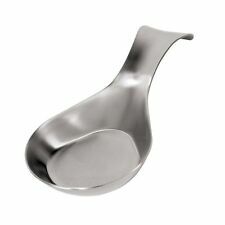 The raised nibs suspend spoons and gadgets so sauces drain away into the spoon rest, not onto your counter. Chef Spoon Rest. We will work with you. Color: White/Beige/Red/Black. You deserve to be treated with 5-Star Service! Allow us the opportunity to correct any mistakes that may have occurred. We look forward to serving you. Floral and polka dot patterns that have made Royal Albert famous the world over. The silicone Spoon Rest by Casabella enables you to keep your spoon handy and your stovetop clean as it attaches directly to the pot rim by a small channel in the bottom! 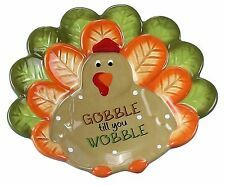 Also has a flat bottom so you can use it anywhere on your counter or table. Give it a rest…or two! Our ingenious Tovolo Stainless Steel Spoon Rest doubles when needed to eliminate cross-contamination. Held together with a strong magnet, these two spoon rests nest neatly together, taking up minimal space. Tartan / Plaid. Tea Spoon/ Tea Bag Holder. Royal Stewart. Featuring a charming illustration, this spoon rest is designed by Libby VanderPloeg in collaboration with Anthropologie. About Libby VanderPloeg. They're not very noticeable unless you're looking for them and this won't affect the use of the piece. This Aubergine color is so pretty and "camouflages" in the lighting as you can see I have taken pictures in different lighting. 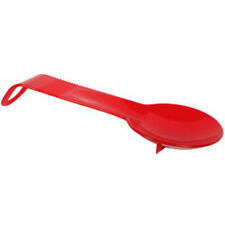 12.0" x 4.0" - great for spoons and cooking utensils!. Looking for a way to stylishly organize your kitchen? Embossed Mason Jar Ceramic Spoon Rest does the trick. A ceramic vintage Red mason jar that helps you organize utensils with style, capturing a retro-chic vintage look. Colorful Painting. Hand-painted Ceramic; Made in Portugal. Since these are handmade and hand painted the one you will receive may be slightly different than what is shown in the picture. Anthropologie MOLLY HATCH. Crowned Leaf Collection. "Molly Hatch is an artist-of-all-trades who creates everything from furniture to jewelry to pen-and-ink drawings, but we especially love her idiosyncratic ceramics. Made by Mud Pie, imported. 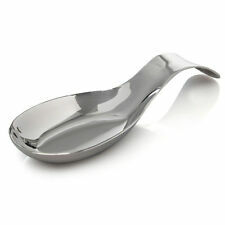 The Oggi stainless steel spoon rest fits just about any size spoon while taking up little room on your counter. Safe for use in the dishwasher. Fits just about any size spoon. Ceramic Apple Spoon Rest. Spoon Rest. Made of durable stoneware! Decorated with polka dot design. Study ALL pictures before purchasing. Usually with pants I provide waist and inseam. This is a Keller Charles Blue Flowers Blue Note. The spoon rest is 9-1/2" long x 4" wide x 3/4" thick. Made of white marble and carved mango wood (spoon not included). Made by Mud Pie, imported. Made by Boston Warehouse, imported. Stainless steel. Buy 2 and get the 3rd FREE! Item Details. Stainless steel. Hot Deal Factory. Buy 2 and get the 3rd FREE! Item Details. The Oggi white ceramic spoon rest fits just about any size spoon while taking up little room on your counter. Safe for use in the microwave and dishwasher. Fits just about any size spoon. Safe for use in the microwave and dishwasher. The Corelle Coordinates by Reston Lloyd spoon rest is a place to rest or sit your utensils while you are working in the kitchen, keeping your counter or stovetop clean. Just rinse or put in the dishwasher to clean. My picture looks more aqua than the teal green it is. Such a beautiful color! OGGI Ceramic Spoon Rest, Black - 5444.3, 8.5" X 4.5" X 1.5"